A Class Act Entertainment - Singing Telegrams and Party Entertainment in the San Fernando Valley and Los Angeles. Birthdays, Anniversaries, Baby Showers, Engagement Parties and every special occasion. ﻿﻿Celebrate a birthday, anniversary, shower or other special occasion with a Singing Telegram. A wide variety of costumed characters deliver your personal message. Choose a gorillagram, hip hop chicken, nurse, cop, biker chick, cheerleader, nerd, opera singer, hula dancer, prince charming and many, many more! Celebrity spoofs will delight your party guests. Favorites include Marilyn, Elvis, Frank Sinatra, Lady Gaga, Adele, Richard Simmons, Edith Piaf, Donald Trump, Britney Spears, Madonna, Mae West, Groucho Marks and many, many more. Call 818-785-1819 to book your favorites "celebrity" today. Our clowns and costumed characters will delight the kids with balloon animals, games, face painting, magic , and puppets. 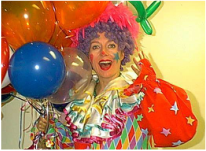 We have clowns, party princesses, superheroes and many other fun characters to entertain all age groups. Add a special touch to the festivities with our Luau Ukelele Group, Magicians, Jugglers or Belly Dancers. We have special entertainment for all the holidays: Mother's Day, Father's Day, Easter, Christmas, Hannukkah, Thanksgiving, Valentines Day, 4th of July and much more!